We don’t offer tons of mills for you to sort through, we only offer our favorite flour mills that we repeatedly sell. These are quality grain mills that will make wonderful, whole-grain, nutrient-filled flour for all your baking desires. By the way, the manual mills have options for motorizing, so you don’t always have to do all of the manual labor under your own power. Release the Creative Chef Within! Create less expensive, homemade, and healthier foods by baking with freshly ground flour and spices using a hand mill or an electric grain mill. 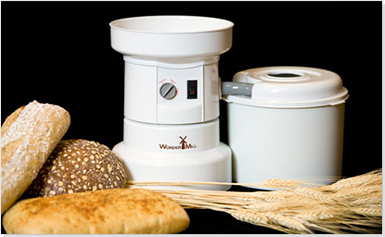 Here are five reasons why owning your own grain mill could help you do just that. Whole white wheat flour is not the same as store bought white flour. There are virtually no nutrients left in "white" flour. Milling you own whole grain flour is so much better for your body and your health. Fresh flour contains more nutrients. Letting your flour just sit for 24 hours after grinding, you will lose 5% of your valued nutrients. Within 6 months, you could lose up to 25% of nutrients. FRESH FLOUR should be used immediately or stored in a dark, dry, and cool environment, like the freezer or fridge in order to retain the most nutrients for longer periods of time. Using Manual Hand Mills are perfect preparation for emergencies when you lose power. Be prepared. 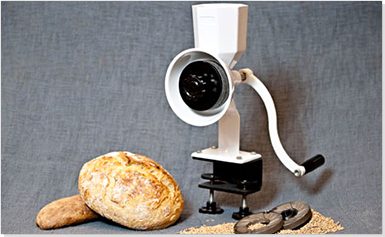 Milling your own flour is considerably LESS expensive in the long run than always purchasing ready-made flour. Make your own specialty food that you can't get anywhere else. Combine different wheat flours for that special touch to your baking. Release the Creative Chef Within! Know exactly what ingredients you add to all your foods by making your meals from scratch- creating a healthier lifestyle for you and your family.